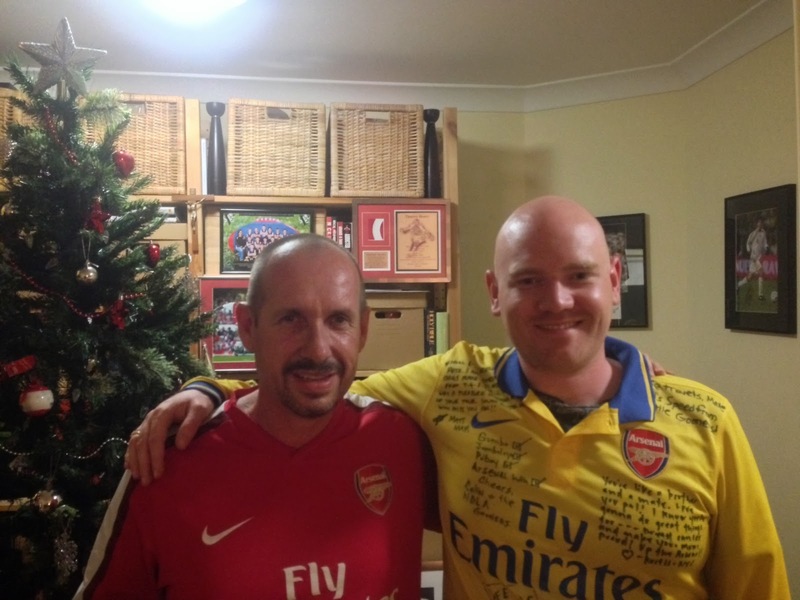 Meet Kevin Sanders, one of the Gooners in Perth that showed me around the city. He gave me $250 for my cause, so it's only right that I ask a few questions about his love for The Arsenal. Kevin grew up in Epsom, Surrey, before moving to Australia in 2008. Kevin just some of his Arsenal shirts. History and tradition. The story of the club from Woolwich to Arsenal. The Marble Halls, the hooped socks, Herbert Chapman. Would a Chelsea or a City fan be proud of their club's roots as much as an Arsenal fan would be of theirs? 1971. In our school class we were all asked to choose our club for the Cup Final, then we'd make a rosette out of milk-bottle tops for the clubs we chose. I chose Arsenal but I can't remember why, but I was obviously influenced by my Uncle who was a big Arsenal fan. I watched the cup final around my uncle's house (because he had colour TV) and I have been sold on the Arsenal story ever since. Thierry or Dennis. 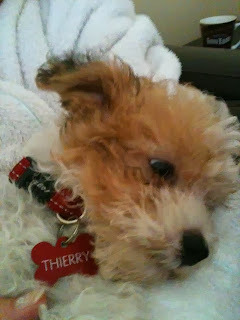 I got a dog and named it Thierry, but then got another dog and named it Denise (she's a girl obviously). I'd have to go with Henry though, I was blessed to be going to Highbury in a period when he was playing the best football of his career. This season it's really difficult to choose, I could pick a new player every week but I'm actually going to go with Podolski, I just think that this season once he's over his injury he's going to be amazing. I love everything he does on and off the pitch, I love his tweets and his Facebook posts. Being at Higbury for the 5-0 win against Leeds in the Invincibles season. Aside from the fact that Henry scored 4, I actually hooked up with an old school friend that I hadn't seen for over ten years which blossomed into my connection with Arsenal Football Supporters Club London, which I became a part of until my move to Perth in 2008. Q. Where do you watch Arsenal in Perth? The Carbon Bar at Perth Casino for the big games. We regularly get a good bunch of fans down there and we are looking to grow. Highbury, just for everything I mentioned at the beginning. But I have to say, we're blessed that we get to play at The Emirates, it was an inevitable decision but we only moved across the street and therefore I (and many others) didn't have to change the matchday routine, getting off at Finsbury Park station, going to the Auld Triangle for pre-match pints, hanging out with AFSC London boys. The same ritual takes place every match day, or so I'm told! We're going to be in the top two. My heart says we'll win, I just think we can grind out the results this year. Q. Who will be Arsenal's player to watch for the second half of this season? Gnabry. I don't think we'll spend in January and I think we're going to need to use him with the fixture congestion. I reckon he's going to make a big contribution. Meet Geof Green, my host in Perth for the Everton match. Geof was born in the UK but moved to Australia when he was a few year old. Q. Why Arsenal? First thing that comes to mind is their history. The fact that they've never been relegated, The Invincibles. The list could go on and on. When Charlie George scored (I forget the goal) I remembered trying to be him. It's been a great team to support throughout their existence. I was about 9 or 10 years old, it was the mid-seventies. I remember watching an Arsenal game on TV at home, just because it was on, and from then on I started trying to watch replays. I even pretended to be Arsenal players when I played football. My Dad is an Arsenal fan, and it wasn't until I was in my twenties that I realised the reason the TV was on that channel with the game playing was because he was bloody watching it. My Granddad was also a Gooner. 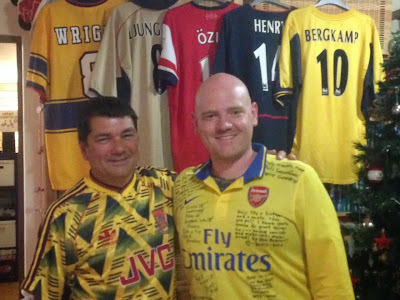 He never really tried to get me into Arsenal though. Thierry Henry. He was classy and I loved his loyalty, even to this day he still calls himself a Gooner. I really like Podolski at the moment. I like the fact that he came to the club and got a tattoo straight away. He's really into the badge and I think his general positive attitude spreads to other members of the squad. Going 49 games unbeaten. I know it's not a 'moment' but that's what I'm most proud of. I watch Arsenal at the Carbon Bar at the Crown Casino downtown. Sometimes we'll get fifteen to twenty people, at other times there'll just be five of us. The time difference can be a bit of a pain at times. It would have to be The Emirates, it's a big stadium and that's helped us to be more competitive in Europe and gives us sustainability. We're gonna win it! I have a good feeling about it. I think United will finish mid-table. I don't think Ozil has really gotten into his stride yet, he's made a great immediate impact but there's still a lot to come from him. The thing is with Ozil is he's not a flamboyant player, but you don't pay big money for flamboyance, you pay for consistency, you pay for assists and goals and that's what he's going to give us.